TWO FAMOUS LINERS, the Olympic, in the foreground, and the Empress of Britain in the background, at Southampton docks. Built at Belfast in 1911 by Harland and Wolff, for the former White Star Line, the Olympic had a tonnage of 46,439, a length of 852·5 feet, a breadth of 92·5 feet, and a depth of 59·5 feet. She was sold for breaking up in 1936. The Empress of Britain was built in 1931 by John Brown & Co, Ltd, for the Canadian Pacific Lines. She has a length of 733·3 feet, a breadth of 97·8 feet, a depth of 56 feet and a tonnage of 42,348. SOUTHAMPTON is the premier port of the British Empire for the great liners. As many as seventeen of the world’s largest liners have sailed from this port in one day. Southampton deals with thirty-seven per cent of the ocean passenger traffic of the United Kingdom - which means that approximately one out of every three persons who enter or leave the United Kingdom passes up or down Southampton Water. Those five sea miles from the port of Southampton to Calshot Castle are a highway of romance. It is a highway along which men have set out and returned from hazardous enterprises, expeditions of high courage and missions of international importance. In war and peace Southampton and the stretch of water that is a gateway of the world has played its part in history. Great ships are neither built nor broken up at Southampton. It is their port when they are in the pride of their glory; and it is at Southampton that great ships are helped to keep their glory. Here is the world’s largest graving dock - the King George V Graving Dock - opened by King George V in July 1933. This dock would be large enough to accommodate a vessel of 100,000 tons. It was built chiefly to accommodate the Queen Mary, and it is one of the world’s engineering wonders. Famous firms such as Harland & Wolff, Ltd, and John I. Thornycroft & Co, Ltd, overhaul the ocean giants at Southampton. Liners are dry-docked for regular overhauls, and, if necessary, they can be dry-docked so quickly that their dry-docking may mean only a brief pause in the liner’s work. The eastern approach to Southampton Water is through Spithead - the channel between the Isle of Wight and the Hampshire shore. The western approach is the Solent, the western arm of the channel that separates the Isle of Wight from the mainland. Southampton Water forms the estuary of two rivers, the Test and the Itchen. The port and docks of Southampton are at the head of the estuary between the two rivers. The narrowest part of the dredged channel of Southampton Water is 700 feet wide, the depth of water at low water ordinary spring tides is 35 feet; and the tidal range between high and low water is 13 feet on spring tides. Double tides, a local phenomenon, have added greatly to the value of the port, especially during the war of 1914-18. The period of high water lasts about two hours, during which the tidal-rise and fall is negligible; the sandy clays and gravel of the channel bed form good holding ground for the anchors of ships. Landlocked as it is, with its approaches protected by the Isle of Wight and with the additional advantages of the double tides, Southampton Water is one of the finest and safest harbours in the British Isles. 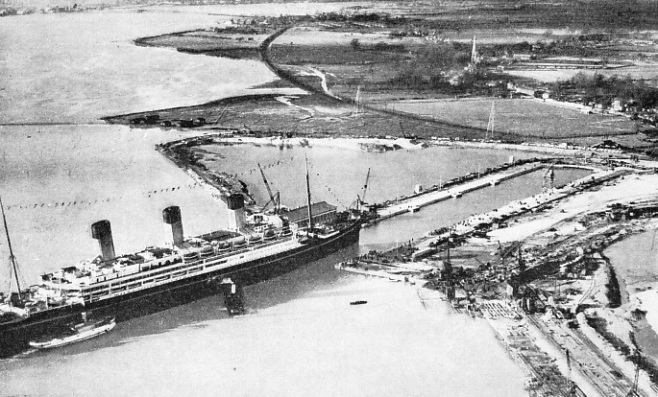 RECENT IMPROVEMENTS AND DEVELOPMENTS of the docks have made Southampton the fourth port in Great Britain for goods traffic. The picture above and the map below show the Docks Extension. In 1927 this was a shallow bay of mud, stretching from the Royal Pier to Millbrook Point. Since 1927 this land has been developed and a 7,000 feet long quay, four passenger and cargo sheds, and the King George V Graving Dock have been built. Southampton is a port of call for foreign vessels as well as the terminal port of many British liners. The freight traffic has expanded rapidly in recent years, for the railway system connects Southampton with all parts of Britain. In addition there is some transhipment trade; many goods arriving by coastal steamers are transferred to ocean vessels. 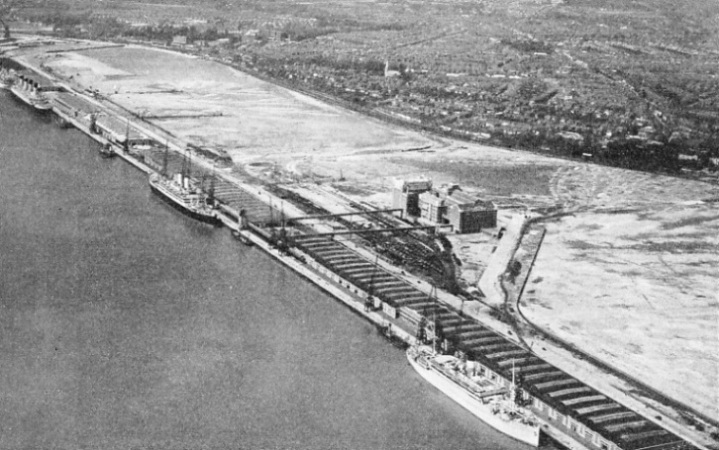 Improvements and developments of the docks have made Southampton the fourth port in Great Britain for goods traffic. The docks are owned and managed by the Southern Railway, and the harbour is administered by the Southampton Harbour Board, composed of representatives of the Admiralty, the War Office, Trinity House, the Southern Railway and various other interests. Only seventy-nine miles from London, Southampton is a natural outlet for passengers and goods bound to and from London. Its position attracts vessels plying between the ports of northern Europe and the Seven Seas. Ships based at Havre, Hamburg, Amsterdam, Rotterdam and ports on the Baltic can call at Southampton without having to go out of their way. The largest vessels afloat can use the approaches to Southampton. The channel used by the largest ships is through Spithead. The Needles Channel which leads into the Solent is used by ships up to 20,000 tons. Pilot vessels cruise in the vicinity of the Needles outside the channel, and in bad weather inside the channel. The isolated rocks called the Needles carry a lighthouse and mark the Western corner of the Isle of Wight. On the mainland side of the channel is a dangerous shoal called the Shingles. There is also the North Channel, between this shoal and the Hampshire coast. North Channel, however, is difficult to navigate and not more than 3½ fathoms (21 feet) deep. The run of tides is strong near the Shingles and vessels have grounded there. The South Channel, as the main channel is called, is about only two cables wide at the entrance, which is guarded by two lighted buoys. The Bridge buoy marks the end of a narrow submerged ridge which extends from the Needles on the starboard side of a vessel entering. The S.W. Shingles buoy guards the edge of the shoal. It is through this narrow gateway that the world’s greatest ships pass out of the western entrance. Entering from the sea a vessel passes Alum Bay and Totland Bay - in the Isle of Wight - and proceeds towards Hurst Point, which juts out from the mainland and forms the Narrows. There are two lighthouses on Hurst Point. The tides in the Solent run with great force, particularly on the ebb, when the water trapped between the Isle of Wight and the mainland comes sluicing out, reaching a speed of at least 5½ knots at one place near Hurst Point. The Bramble Bank is a large and dangerous shoal south of the entrance to Southampton Water. The Calshot Spit Lightship marks the passage for vessels between the Bramble Bank and the Hampshire shore. ONLY SEVENTY-NINE MILES FROM LONDON, Southampton is the gateway for the industries of the South of England. The quick rail transport facilities have helped to develop the trade of the port, particularly in South African fruit. In 1934, 3,500.000 packages of citrus and deciduous fruits such as plums, peaches, apricots, mangoes, grapes and pineapples, were unloaded at Southampton, generally at the berths in the foreground of this picture. The seaward approach from the east is through Spithead. A vessel coming from the sea passes between Bembridge Point - the eastern extremity of the Isle of Wight - and the shoals off the low-lying Hampshire coast; the way in from the south-east is marked by the Warner Lightship and the Nab Tower. The Nab Tower is a concrete and steel structure which was built during the war at Shoreham, in Sussex, and was known as the Mystery Tower. The Princess Shoal and Bembridge Ledge, and the Nab Rock, are dangers on the port hand as a ship approaches; the Horse and Dean Sands lie to starboard. Horse Sand Fort rises above the sand on the starboard side, and to port is No Man’s Land Fort. All ships pass between these two forts. Vessels bound for Southampton pass between Ryde and Southsea, towards Cowes. Gosport and Lee-on-SoIent are on the starboard hand. Shoals extend from the Isle of Wight. Ryde Middle is a shoal in the centre of the channel, but has five or six fathoms on either side and is well buoyed. The channel for large ships into Southampton Water is on the west side of the Bramble Bank shoal, although smaller vessels are able to sail east of it. Calshot Castle is to port as a ship goes up Southampton Water. The deep-water channel lies practically in the middle of Southampton Water. Tankers berth at a jetty near the mouth of the River Hamble, on the starboard side, and discharge oil for storage in large tanks. Southampton Water is one of the world’s most interesting and colourful stretches of water. It is used by almost every type of vessel. Paddle-boats ply to and from the Isle of Wight. Big liners come up with the tide, as do speedboats whose keels seem scarcely to touch the surface. Luxurious motor and racing yachts are anchored out of the fairway; freighters, tramps and every type of merchant vessel use Southampton Water. In those five sea miles can be seen a pageant of the World’s shipping. ENTERING THE WORLD’S LARGEST GRAVING DOCK. The 56,000-tons Cunard White Star liner Majestic entering the King George V Graving Dock. This dock, situated at the western end of the Extension, was opened by H.M. King George V on July 26, 1933, and is 1,200 feet overall, and 135 feet wide. The depth over keel blocks at high water ordinary spring tide is 48 feet, and at high water ordinary neap tide, 45 feet. The port of Southampton lies at the-tip of a tongue of land between the rivers Test and Itchen. The docks area consists approximately of a long frontage facing south-west along this spit. The greater length of it is land reclaimed from the mud-flats of the Test. The other side of the docks area fronts east on the Itchen. At the apex of the angle are the old docks from which the prosperity of Southampton has grown. 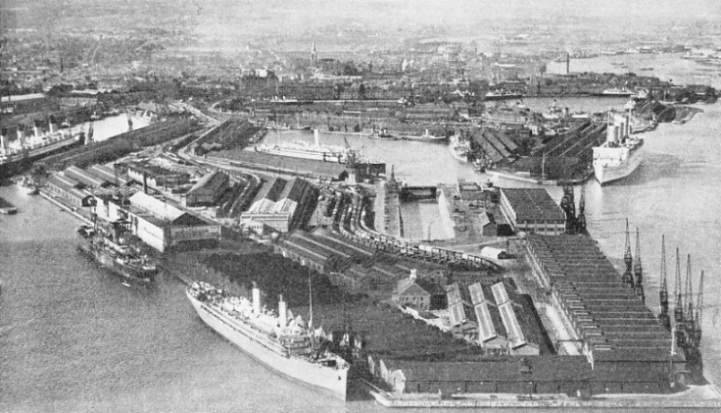 were opened in 1875, and the next step was the opening of the Empress Dock of eighteen and a half acres in 1890. Two years later the London and South Western Railway, now the Southern Railway, took over the docks. Since then the dock area has increased, and the population of the port has nearly trebled. The docks and deep-water quays jutting out into the confluence of the two rivers reached the farthest point possible along the Itchen, ending at the South Quay: then the railway company built the Test Quays and the Ocean Dock, fifteen and a half acres. The Ocean Dock was completed in 1911, and was at first called the White Star Dock, as it was intended for the big liners of that company which had decided to make Southampton its terminal port. Other great lines followed this lead, however, so the name of the dock was changed to the Ocean Dock in 1922. No fewer than five large liners can berth in the Ocean Dock at the same time. On one notable occasion the Mauretania (30,696 tons), Berengaria (52,101 tons), Homeric (34,351 tons), Majestic (56,599 tons) and Olympic (46,439 tons) - making an aggregate total of 220,186 tons - were in this dock together. A GREAT EVENT IN THE HISTORY OF SOUTHAMPTON. The arrival of the RMS Cunard White Star liner Queen Mary in the King George V Graving Dock after having sailed from the Clyde in March 1936. 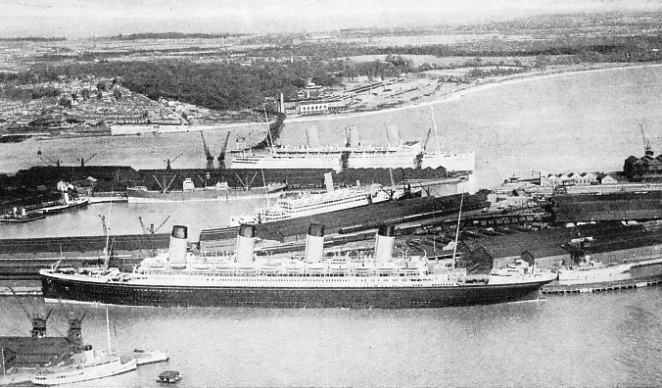 The three ships to the left of the Queen Mary are the Twickenham Ferry (2,839 tons), the Southern Railway’s car and train ferry, the Cunard White Star Majestic and the Union Castle liner Windsor Castle (18,973 tons), the bows of which can be seen immediately behind the stern of the Majestic. In addition to these wet docks - only one of which, the Inner, is non-tidal - dry docks were built. There are six in this area, the largest being the Trafalgar Dock, which is 912 feet overall and 100 feet wide, and can therefore take most of the world’s largest ships. The Trafalgar Dock was completed in 1905. Its construction was hurried on to meet the growing demands of German shipping, then becoming a big factor in the transatlantic trade. Southampton, by reason of its position, had a natural attraction for the German-American traffic. All this is typical of Southampton enterprise. When the American liners first came to the port, in 1893, they could only just get over the mud. Three years later there was a minimum depth of 30 feet. The seventh dock, the King George V Dock, is 1,200 feet overall and 135 feet wide, situated at the western end of the Extension Quay. The Trafalgar Dry Dock is at the western end of the older dock system. Farther west are the Town Quay, Royal Pier and a recreation ground. Westward to Millbrook Point the Extension Quay extends for nearly a mile and a half, nearly 8,000 feet, and accommodates eight of the largest ships afloat, the minimum depth of water being 40 feet. The construction of the Extension Quay is one of the greatest engineering feats undertaken in Great Britain. A huge area had to be dredged and reclaimed before the concrete quay could be added. An untidy waste of mud-flats between two points was filled in, and the river dredged so that ships could berth. About 20,000,000 tons of silt and soil had to be shifted. The dredgers first scoured a channel two miles long and 600 feet wide, and dredged it to a depth of 35 feet, and of 40 and 45 feet along the quay wall. The soft mud formed a bed between 6 feet and 20 feet deep, and this had to be dredged and dumped out at sea. Under this was a stratum of gravel from 2 feet to 7 feet thick. This was valuable, as it was made into concrete or used to build up banks. The sand and clay underneath were also useful for building up the foreshore. Below the clay the dredges brought up trunks of trees that once formed part of an oak forest. Bones of deer and the teeth of a wild boar were also found. Laden with the spoil from the dredges, the barges were towed to the site of the new land. 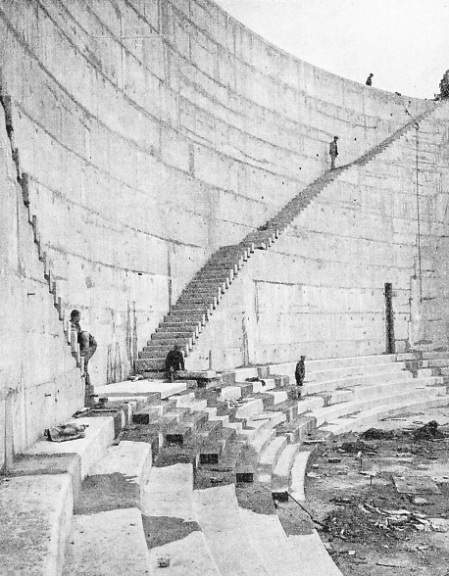 First the engineers built up a bank on which to put their gear. Then they enclosed the muddy area, shutting out the tide and leaving a muddy lake to be filled in. The spoil in the barges was saturated with water from pipes, and this mixture was pumped through other pipes until the muddy lake was gradually filled. Monoliths - concrete boxes about 45 feet square, and made on the site - were sunk to provide the foundation for the long quay. Every monolith had a steel cutting edge as its base and was laid in sections, a standard monolith weighing about 5,000 tons. There are 146 under the quay and they were sunk to 70 feet and 100 feet. Often the edge of the monolith encountered boulders which had to be removed by dropping a steel-toothed grab down the well of the monolith. When a monolith began to cant it was coaxed into an upright position by laying cast-iron blocks on the higher side until the weight forced the monolith back into position. Water threatened to burst up from below the dock, but tube wells were sunk into the sand and the danger was averted. The dock, which is 59 ft 6-in deep, holds 260,000 tons of water and can be emptied in four hours by centrifugal pumps. The steel door, which weighs 4,600 tons, was floated round to Southampton from the Tees, where it was made. This great dock, named after King George V, who opened it, is the “cot” of the Queen Mary, in which she rested when her propellers, rudder and underwater sections were examined after her trip from the Clyde in March, 1936. The four 54-in centrifugal pumps are electrically driven. There are two travelling cranes, one lifting 50 tons and the other 10 tons. The largest crane in Southampton is the 150-tons floating crane, which has three hoisting gears. The main hoist can lift 150 tons on two hooks at a maximum radius of 106 feet; the auxiliary hoist can lift 40 tons at 131 feet radius, and the traversing trolley which runs the length of the underside of the jib has a hoisting gear for 10 tons. The speed of the main hoist is 8 feet per minute for 150 tons, and 16 feet for 75 tons. The auxiliary will lift 40 tons at 20 feet per minute and 20 tons at 40 feet; the hoisting speed of the traversing trolley is 60 feet per minute. 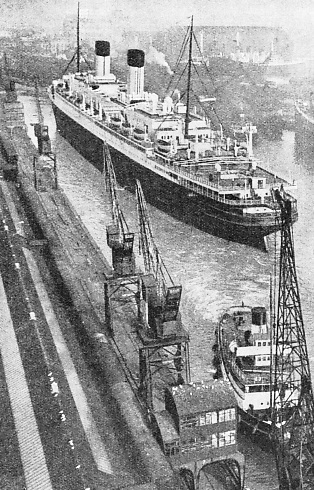 THE CONSTRUCTION OF THE KING GEORGE V GRAVING DOCK was carried out in the remarkably short time of under two years, the work having been started in June, 1931, and completed in April, 1933. Some 2,000,000 tons of earth were excavated and about 750,000 tons of concrete were needed for building the walls and floor. There is a 50-tons electric crane at the Trafalgar Dry Dock. The docks equipment includes a 30-tons steam travelling crane and steam, hydraulic and electric cranes of various capacities. Fuel oil is supplied by various companies which have storage tanks on Southampton Water, and the oil is taken in barges alongside vessels and pumped from the barges at the rate of 500 tons an hour for each barge One company has supplied liners at the rate of over 1,500 tons an hour by this method. The coal jetty is on the Itchen, but coaling is generally done alongside each vessel. Public interest is centred on the Atlantic liners, and the chief lines are the Cunard White Star, the Compagnie Generale Transatlantique - calling at Cowes Roads - United States Lines, Red Star Line, Hamburg American Line and Norddeutscher Lloyd. The distance to New York is estimated variously according to the route taken by the different lines, and according to the time of year. The United States Hydrographic Office computes the distance from Southampton to the Battery, New York, at 3,095 nautical miles for the northern route from August 15 to January 14, and 3,192 miles by the southern route. Another authority calculates the respective distances at 3,160 and 3,246 miles. The Cunard White Star and the Canadian Pacific lines run a summer service to Quebec, 2,880 miles, and Montreal, 3,019. Cape Town is 5,987 miles by the Union Castle mail route, and 6,480 by the German East Africa Line’s route. Sydney is 12,137 miles by the Aberdeen and Commonwealth Line’s route. Wellington, New Zealand, is 11,133 miles by the Shaw, Savill and Albion Company’s route. Rio de Janeiro and Buenos Aires are served from Southampton by the Royal Mail Lines, and by the Hamburg South America Line. Singapore is served by the P. & O. Steam Navigation Co., the East Asiatic Co., the Rotterdam Lloyd and the Nederland Line, and Vancouver by the Royal Mail, Holland American and East Asiastic companies. These are some of the principal ports served regularly from Southampton, and the list shows the world-wide connexions of the port. At one period in 1935 eight of the eleven merchant ships in the world with a tonnage in excess of 40,000 tons gross were making Southampton either a terminal port or a port of call. These were the Majestic, Berengaria, Aquitania, Olympic (Cunard White Star), Empress of Britain (Canadian Pacific), Bremen and Europa (Norddeutscher Lloyd) and the Ile de France (Compagnie Generale Transatlantique). The only two other ships were the Rex and the Conte di Savoia of the Italia Line, whose route is to the Mediterranean via Gibraltar. The Normandie, 86,496 tons gross, made Southampton her first port of call on her westward passage across the Atlantic after she had entered service. Although the name of Southampton is inevitably associated with the ocean giants, every type of merchant vessel uses the port. The Town Quay is particularly suited to the coasting trade. Ships up to 300 feet in length, with 20 feet draught, can be berthed at the open quay day and night without the assistance of tugs. There are berths for seven or eight large steamers and accommodation is available for numerous small craft. In addition to the long distance cargo traffic, there is a considerable trade with France and the Channel Islands. The Southern Railway turbine steamers ply between Southampton and the Channel Islands, Havre and St. Malo, and bring passengers, fruit, vegetables and other produce. The quick transit and cold storage facilities have been utilized to develop the trade in South African and Californian fruit. Apart from citrous fruit, such as oranges, huge quantities of deciduous fruit, such as plums, peaches, apricots, mangoes, grapes and pineapples are unloaded at Southampton. Over 3,500,000 packages of this type of fruit were received in 1934. The import of French and Spanish wines has been a leading feature of the port since early Norman times. The many old wine cellars at the lower end of the town remain as evidence of the early days of this trade. A n interesting development was the decision of the Red Star Line to make Southampton a port of call for the Westernland and the Pennland on the New York-Antwerp service; these liners are partly floating garages. The former third-class accommodation on three decks of these liners was converted into garages for carrying uncrated motor-cars. When the liner berths at Southampton the cars are brought up from below on an electric lift to the deck, and then moved to another lift which lowers them down the side of the ship to the quay. Although Southampton was an ancient seaport in the early days of the Christian era, when it was known as Hamptun, it was not until the opening of the Outer Dock, in 1842, that Southampton was in a position to challenge the other ports of Britain. Then the population of Southampton was 28,500. It was obvious that the fortunes of the town of Southampton would grow as the port grew. In 1851, when the Inner Dock was opened, 35,305 people were living in Southampton. This figure had increased to 64,405 when the Empress Dock was opened in 1890. The greatest increase in the growth and importance of Southampton has occurred since 1892, when the docks system passed from the Southampton Dock Company to the London and South Western Railway Company (now merged in the Southern Railway Company). The London and South Western Railway Company at once increased the accommodation and improved the port’s facilities. In that year the population of Southampton was 65,621. Twenty years later the population had nearly doubled, being then 120,512. In 1933, 179,000 people were living in Southampton. THE WORLD’S LARGEST LINERS use the Ocean Dock at Southampton. 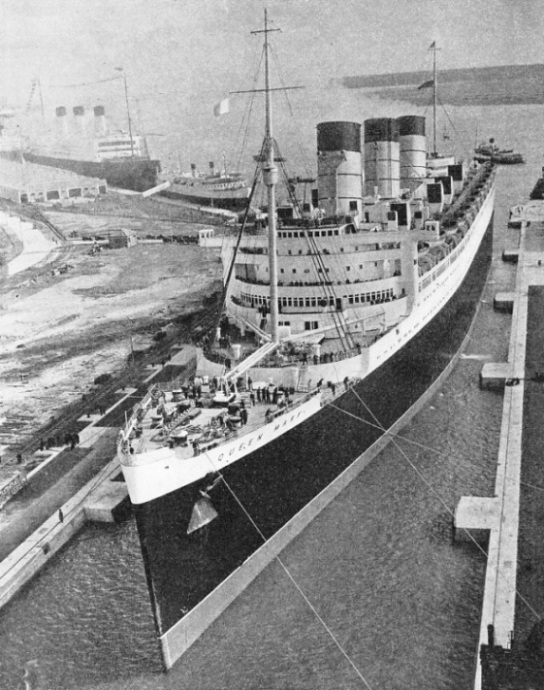 On one occasion the Mauretania (30,696 tons), the Berengaria (52,101 tons), the Homeric (34,351 tons), the Majestic (56,599 tons) and the Olympic (46,439 tons) berthed at the same time in the Ocean Dock. This dock, completed in 1911, was first known as the White Star Dock, as it was intended for the big liners of that company. Other great liners also used it, however, and its present name was adopted in 1922. This illustration shows the Homeric being berthed in the Ocean Dock. You can read more on “Great Ports of the World”, “A Great Ship Sails” and “The World’s Largest Ships” on this website. You can read more on “The World’s Largest Graving Dock” in Wonders of World Engineering.